Candy makes a colorful design for an iPhone 5 case - and here are some of my best picks for those with a sweet tooth. You may wonder if this article was written by a sweet tooth. Well yes I admit like to treat myself now and then. But beyond being a sweet treat candy is also nice and colorful so it can create some bright iPhone 5 cases. 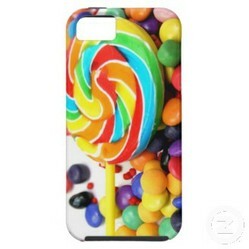 Cases using photos of real candy have a lot of contrast between the bright colors so they're very eye-catching. Art based designs aren't usually as bright looking - but they have a cute look on an iPhone case. So here are my best picks of candy inspired iPhone 5 cases. Depending on where you live this type of candy might be known by brand names like "M&Ms" or "Smarties". These candies are an all time favorite with adults and kids. Most importantly though when we're talking about iPhone cases they're full of bright color. Although each candy is only one color because they're small you can fit a lot onto an iPhone case. This means you get lots of color. Blue, pink, purple, red, yellow, green, orange and brown all appear in these candies. Giving this iPhone case a bright, fun and happy feel. Need the iPhone 4 Case? This one features a lollipop and varied candy pieces. Although there are lots of colors in this iPhone 5 case, the dominant colors are the warmer ones. Specifically yellow, red and orange. This gives the iPhone case a warm rather than bright and colorful feel. So it's a different effect than the Chocolate Candy iPhone case. This Sweet Surrender is also one of the very few photographic cases that features a lollipop. So it's a good choice if you are after a case featuring one of these bigger sweet treats. Need the iPhone 3 Case? Truthfully I'm not a fan of gummy bears. There's other types of candy I prefer. But I know gummy bears are a big favorite. I've had many friends who have been mad about these little sweet bears. So I've included this case in my list because of their brightness and popularity. Gummy bears are actually rare on an iPhone 5 case. This was the only one I saw. A shame when they're so popular. But this case has a nice design luckily so it's a fun choice for gummy bear fans. This iPhone case is a cute one. It's the only art based design I decided to include because of it's high quality. The colors the designer has chosen nicely add to the sweetness of this design. It also has a softer feel than the photographic cases so it makes a nice option if the contrasting brightness of the photo designed cases isn't to your taste. The other thing I like about this iPhone case is that you can personalize the design with any name. The editing software isn't hard to use. If you've ever had experience with any type of editing program or website tool you should be right. If in doubt I find the nearest 11 year old who usually know exactly how these things work. So a good choice for it's artistic design and ability to personalize the name on it. The Lollipop Polka Dot iPhone Case doesn't currently come in an iPhone 3 case. The designer does have their contact details available though. So you can always contact them and ask if an iPhone 3 version could be added to the list of iPhone formats this case comes in. This licorice inspired iPhone 5 case has a definite style. The black and white of the licorice gives it a more refined feel than the brightness of the other cases. This makes it a more subtle choice than the other cases I've chosen. The yellow, pink and brown highlights in the licorice also add interest and color to the basic black and white. So together the mix of colors creates a striking effect with a candy that's generally eaten by adults rather than kids. So if you're wanting a more grown up looking, but still candy inspired, iPhone 5 case check this one out. Unfortunately the designer of this iPhone 5 case does not have a contact option. So you aren't able to ask for this design to be created in any other format than the iPhone 5. I also couldn't find any similar licorice designs in an iPhone 3 format, like I was able to with the iPhone 4. A chocolate bar iPhone 5 case is the perfect choice for chocoholics ! !